South Korea's communication watchdog on Tuesday slapped fines on an operator of a cryptocurrency exchange in the country for allegedly leaking the private data of its users in its first punitive action against an administrator of such exchanges. The Korea Communications Commission decided to impose fines totaling 60 million won ($54,970) on BTC Korea.Com, an operator of Bithumb, the largest bitcoin and ethereum digital currency exchange in South Korea, for its alleged negligence in the protection of its users' information. Cryptocurrencies, such as bitcoin and ethereum, have rapidly gained popularity in recent years, and South Korea is home to one of the world's largest bitcoin exchanges, with about 1 million people estimated to have some of the best-known digital currency. 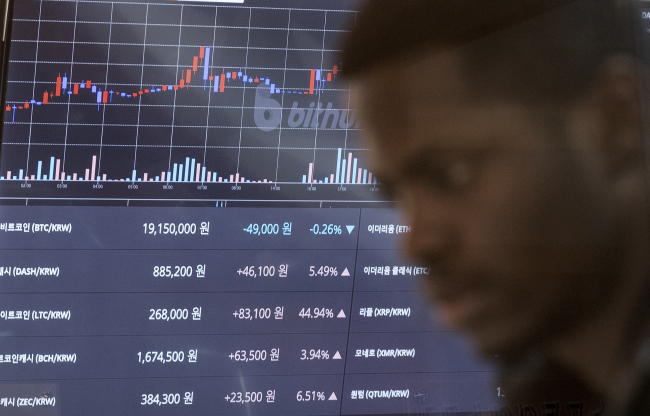 Hackers stole the private information of the exchange's users twice as BTC Korea.Com stored such data in computers without encrypting it or updating its anti-virus software, according to the watchdog. "The punitive action was taken as the operator did not comply with protective steps, making it vulnerable to hacks and causing leaks of personal data and financial damage," the KCC said. But experts said that the watchdog's punishment is deemed too light, given a sharp rise in cryptocurrency transactions. South Korea's financial regulator is considering measures to restrict cryptocurrency transactions in the country, including an all-out ban, to cool down the worldwide craze for digital currencies. South Korea's No. 3 lender Woori Bank and the state-run Korea Development Bank said that they plan to close virtual accounts opened for digital currency exchanges this year, a move that will effectively cut off such transactions.